This year the Australian Human Rights Commission will celebrate 40 years of the Racial Discrimination Act 1975 (Cth). It will be an occasion for us to reflect on what the Act has achieved and to consider systemic progress under the Act in the future. 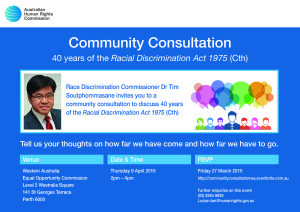 We are planning a public consultation in each state and territory to promote understanding of the Act, and to hear from the community about how we can most effectively advocate on issues of racial discrimination. Among other things, these consultations will help inform a publication I will release later this year. I would like to invite you to the Perth consultation. Please see attached a flyer which you are welcome to distribute to your networks. We expect the consultation to go for no longer than 2 hours and refreshments will be provided. This should be an excellent opportunity to hear from the community and I hope to see you there. 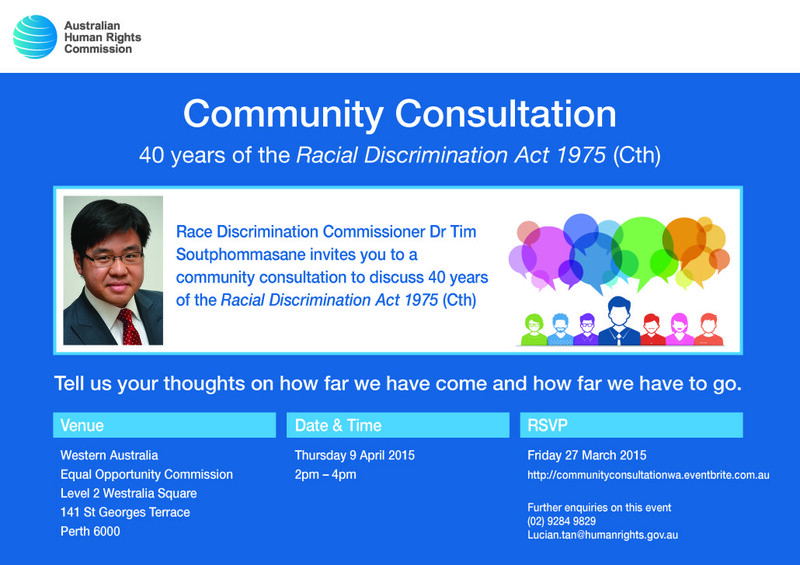 Please RSVP by Friday 27 March 2015 via Eventbrite at http://communityconsultationwa.eventbrite.com.au. For enquiries please call Ms Samantha Schubert on (02) 9284 9829.